You can complain about the closed nature of Apple's software, but you can't deny that the marriage of iTunes and iOS is as cohesive as it gets. This desktop-mobile connection missing from the Android experience...until you install DoubleTwist. DoubleTwist features an attractive white and blue interface that looks a whole lot like iTunes. 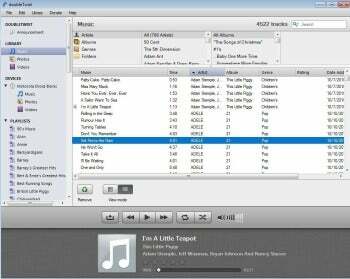 DoubleTwist is a free, lightweight desktop application that looks and feels like iTunes, thanks to its neatly organized layout and its white-and-blue color scheme. Once it's installed, DoubleTwist automatically finds and organizes the music, photos, and videos you have stored on your computer, even those in your existing iTunes library. Once your collection is organized by DoubleTwist, the application lets you browse through your media files by artist, album, playlist and more. You can view a list of titles, or switch to an icon view that displays album artwork. DoubleTwist is good as a desktop media player. It's fast and easy to use. It played back all of my audio files without a problem, even those that I had purchased from iTunes. It stumbled when I tried to playback videos purchased from iTunes, though, as it was unable to do so. DoubleTwist really makes its mark through its Android connections. Connect your Android device to your computer via USB, and DoubleTwist automatically identifies it for you. An icon for your device is added to DoubleTwist's menu, just as iTunes adds an icon for a connected iPhone or iPod. You can then choose which files to sync to and from your computer to your mobile device. Syncing is quick and painless, and you can gauge the progress at a glance, thanks to the on-screen progress bar. DoubleTwist stumbled when I tried to sync videos purchased from iTunes to an Android phone, saying it could not convert them to a supported format. It did sync purchased music without a problem. DoubleTwist is free and does not require that you install anything on your mobile phone. But if you'd like to use DoubleTwist as your mobile media player, you can download the free companion mobile app. Upgrading to the $4.99 AirSync app adds wireless syncing. Android users who have lusted for the iTunes experience needn’t suffer anymore. Download DoubleTwist and get syncing. The one downside: It lacks its own built-in downloads store. But, hey, you can't have everything, can you? Manage media on your Android phone with this free beta.